(91outcomes.com - December 16, 2015) - A budget deal late Tuesday cleared the final omnibus spending bill with good news for ill Gulf War veterans. The treatment-focused, Gulf War Illness Research Program (GWIRP) will be renewed for another year, and with full funding. The peer-reviewed medical research program is part of the Congressionally Directed Medical Research Program (CDMRP), a program funded within the U.S. Department of Defense (DoD) but takes its direction from Congress. It's aim is simple and to the point: "To improve the health and lives of veterans who have Gulf War Illness." Led by Rep. Phil Roe, M.D. (R-Tenn.) and Rep. Tim Walz (D-Minn.) in the U.S. House of Representatives and Senator Tammy Baldwin (D-Wis.) in the U.S. Senate, eighty Members and Senators called on the leadership of the Defense Appropriations Subcommittees to continue to adequately fund the program. Among the 80 cosigners to the letters were Rep. Jeff Miller (R-Fla.) and Rep. Corrine Brown (D-Fla.), Chairman and Ranking Member, respectively, of the House Veterans Affairs Committee, Veterans' Affairs Subcommittee Chairs and Ranking Members Rep. Dan Benishek (R-Mich.), Rep. Mike Coffman (R-Colo., a Gulf War veteran himself), Rep. Julia Brownley (D-Calif.), Rep. Ann Kuster (D-N.H.) and Rep. Mark Takano (D-Calif.) , and Sen. Bernie Sanders (I-Ver. ), past Chairman of the Senate Veterans' Affairs Committee. "While we have made progress in the fight against Gulf War Illness, many challenges remain. .... It is critical to the program’s success and accountability that it remains a stand-alone program within CDMRP." "The Gulf War Illness Research Program (GWIRP) was initiated in 2006 to provide support for research of exceptional scientific merit to study the health effects of deployment on U.S. Warfighters during the 1990-1991 Persian Gulf War. The GWIRP challenges the scientific community to design high-impact research that will improve the health and lives of Veterans who have Gulf War illness (GWI). "GWI is characterized by multiple, diverse symptoms that typically include chronic headache, widespread pain, cognitive difficulties, debilitating fatigue, gastrointestinal problems, respiratory symptoms, sleep problems, and other abnormalities that could not be explained by established medical diagnoses or standard laboratory tests. The population of Veterans affected by GWI is a subset of the nearly 700,000 U.S. Warfighters who served during the 1990-1991 Gulf War. Studies indicate that approximately 25-32% of Gulf War Veterans continue to experience symptoms associated with their deployment. "The GWIRP focuses on funding innovative, competitively peer-reviewed research to (1) provide a better understanding of the pathobiology underlying GWI, (2) identify objective markers (biomarkers) for improved diagnosis, and (3) to develop treatments for the complex of GWI symptoms and their underlying causes. Our Vision is to make a significant impact on GWI and improve the health and lives of affected Veterans and their families." "I have a deep respect for the entire CDMRP team and the fact that Consumer Reviewers are treated as equal partners. My experience has given me a renewed respect for the scientific process. With the understanding that quality research and development is a slow painstaking process; and that 25 years is a long time for veterans to wait for answers, I am excited that Gulf War Illness research is moving towards more human subjects studies with practical applications. I am less concerned with the cause of Gulf War Illness and more concerned with practical applications of how we can make life more functional for veterans with Gulf War Illness and their families." Led by Veterans for Common Sense (VCS), the funding request was also supported by the American Legion, AMVETS, Disabled American Veterans (DAV), National Vietnam and Gulf War Veterans Coalition, Paralyzed Veterans of America (PVA) Sergeant Sullivan Center, Veterans of Foreign Wars (VFW), Vietnam Veterans of America (VVA). The program's renewal comes at the same funding level as the last three years, $20 million, precisely what Gulf War veteran advocates were seeking. SOURCE: The (Lynchburg, Va.) News & Advance, 11/25/2015, Jessie Pounds reporting. Soldiers were getting sick and no one knew why. So in 1993, senate staffer Jim Tuite, now a political science professor at Central Virginia Community College, began work on an investigation into symptoms of Gulf War veterans — an investigation later chronicled in the dramatized Showtime movie “A Grateful Nation.” Tuite is played by Ted Danson. In the movie, the Tuite character takes a pointed phone call from a lieutenant colonel, telling him and Senator Donald Riegle not to put out a report detailing their findings. Today, Tuite lectures about the powers held by various parts of government to community college students. There’s no need to scribble in a notebook or type into a smart phone, because he provides notes. He wants students watching his face as he talks. On a Friday morning before fall break, he paced back and forth in front of a government class, discussing federalism in the United States and topics ranging from military draft laws to police search and seizure. He pushes his student to register to vote and to develop the skills they need to sort through the avalanche of data and opinions to make up their minds on political issues. “I don’t care which way they end up thinking, but I at least want them to be able to weigh the facts,” he said. 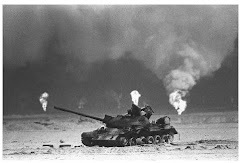 In 1990 and 1991, an international coalition led by the United States delivered a swift defeat to Iraqi dictator Saddam Hussein, ending his invasion of neighboring Kuwait. Gulf War Illness, or Gulf War Syndrome, as it is sometimes called, is a set of varying symptoms appearing in veterans of this war. These include widespread pain, headaches, persistent memory problems, trouble with thinking, tiredness, respiratory and gastrointestinal issues, and skin abnormalities. That’s according to a report presented Sept. 22, 2014 by the Research Advisory Committee on Gulf War Veterans’ Illnesses of the U.S. Department of Veterans Affairs, updating an earlier report from 2008. The report states unequivocally Gulf War illness is a physical, not psychological, disease. More than 25 percent of the 750,000 U.S. troops participating in the First Gulf War are affected by Gulf War Illness, according to the report. Its estimates range from 175,000 to 250,000 people. This set of symptoms is significantly more common in Gulf War veterans than in other soldiers of the time or the general population. There’s no known cure for Gulf War Illness and, on average, it doesn’t look like health is improving among those who suffer from it. Looking back, Sen. Riegle said, it was clear just how suited Tuite was for the investigation at hand when he first began looking at Gulf War illness and possible troop exposures during the war. “He had these special capabilities that were almost a perfect match for this sort of inquiry,” Riegle said. Tuite began his career at the age 18, as an Army medic in the Vietnam War, evacuating wounded troops. He left the army after two years and started college, hoping to become a chemist, before changing course and taking a job as a D.C. police officer. From there, he earned his bachelor’s degree in Administration of Justice, and took a job with the Secret Service. The work gave him a behind-the-scenes glimpse into the humanity of presidents, ex-presidents, candidates and top officials. Tuite’s time there included investigations, protective intelligence, foreign intelligence, counter-terrorism, forensic science research coordination and chemical hygiene. Tuite was working on a doctoral degree in world politics when he heard about an opening for a fellow at the U.S. Senate. In that role, he became interested in an ongoing Senate investigation into mysterious symptoms exhibited by Gulf War veterans and he took on a job serving Sen. Riegle, then head of the Senate’s banking committee. “They wanted me to look at this one veterans issue and I was like, ‘it doesn’t look good, it looks like there were chemical exposures,’” he said. Tuite pursued the investigation on several fronts: looking at soldiers’ symptoms, evidence of possible exposures to chemical weapons, and evidence of harmful exports from the U.S. to Iraq prior to the war. He found evidence of biological weapons components exported from the U.S. to Iraq in prior years, evidence that fit with other reports of potentially dangerous materials and technologies allowed to enter Iraq prior to the chilling of relations with the U.S.
Tuite relied on his background as an investigator for his approach to trying to get information from government agencies. Riegle called Tuite smart, dogged and serious. “That’s what you need in government, people who are truth tellers, who are willing to stick with things,” he said. Riegle retired from the Senate in 1995. Tuite became an independent national security and government relations consultant, still heavily invested and interested in Gulf War Illness. In the years since the Gulf War, many scientists and researchers have tried to pinpoint what toxic substances soldiers might have been exposed and which, if any, of those exposures in turn caused Gulf War Illness. Three of the suspects share chemical characteristics. Certain pesticides used during the war, the active ingredient in pills given to some troops to counteract possible nerve gas exposure, and the chemical weapon Sarin gas all fall in the category of acetylcholinesterase inhibitors, which can have varying degrees of neurotoxic effects on humans, depending on exposure level. 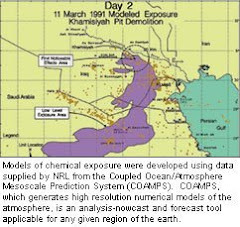 The 2014 report from the RAC, reiterates findings from an earlier 2008 report, suggesting Pyridostigmine Bromide in the pills, and pesticide exposures are causes of Gulf War Illness. However, a 2010 report from the Institutes of Medicine disagreed with the RAC, saying the evidence did not support labeling those or other specific exposures as causes. U.S. Marine Corp. Major Adrian Rankine-Galloway said in an email the Department of Defense wrote to about 101,000 people in 2000, letting them know they possibly had been exposed to low-levels of chemical warfare agents related to the demolition of unsuspected chemical weapons in a pit near Khamisiyah, Iraq, in 1991. The department does not have estimates for exposures for people who weren’t U.S. service members. Tuite however, continues to be interested in the question of exposures to chemical weapons during the gulf war. In 2012, he and epidemiologist Robert Haley published two linked papers arguing coalition bombing of Iraqi’s chemical weapons infrastructure early in the war created fallout that traveled long-distances and ultimately affected the health of U.S. troops. Around 2000 to 2001, Tuite and his wife moved into to a horse farm in Gretna they’d first purchased in 1994. For years, Tuite commuted from there to various jobs, including a stint as National Security Policy Advisor to Sen. Robert Byrd, D-West Virginia. So teaching at CVCC is his closest post in a decade and a half. He started with just one class in 2011. Now, CVCC has hired him to teach full time, starting this semester. He now teaches six sections of a two-semester class on the American political process. CVCC Vice President Muriel Mickles remembers when Tuite first asked her for a job she came away impressed by more than just his resume. “You are looking at the personality of the person, you are looking at the way they approach you, you are looking at their warmth, and he had all of those ingredients,” she said. She was a little unsure he’d be willing to consider what CVCC was willing to pay, but he accepted. “He said, ‘I want to teach. That’s what I want to do. I want to teach. I’ve got something to give and while I’ve got it to give, I want to share it,’” she recalled. Tuite establishes a rapport with his students and going out of the way to work with students who were struggling, Mickles said. “So needless to say, we hired him,” she said. In “A Grateful Nation” the Department of Defense comes across as villainous. Riegle said he still is embittered about DOD’s handling of the situation. He said while it can be necessary to go down a rabbit hole in pursuit of the truth, people have a tendency to leap down the first rabbit hole that suits them rather than scoping out the field. Tuite said this concept relates to what he is trying to teach his students about looking at issues from different perspectives. There are serious questions to be asked, he said, about how a government should balance the needs and wants of various people and groups against one another. Editor's note: Dr. Jarred Younger, featured in the news article below, is currently funded for Gulf War Illness treatment research by the Gulf War Illness Congressionally Directed Medical Research Program (CDMRP), within the U.S. Department of Defense. Some of the anti-inflammatory treatments described in the article below are part of that funding. A Fiscal Year 2011 CDMRP-funded study (GW110044) by Dr. Younger and his research team at the University of Alabama at Birmingham found, "preliminary evidence that the immune system is involved in the pathophysiology of GWI." The publication of his study's results in a peer-reviewed medical journal further suggested, that immune profiling over time, "may be helpful in discovering targets for novel therapies in conditions such as GWI." Dr. Younger's current treatment study, which builds on those findings and was funded by CDMRP using FY13 funds (GW130015), is, "designed to test nine plant-based compounds that may reduce inflammation and help those with GWI." "We believe that GWI is caused by inflammation in the brain. The inflammation results from overactive immune cells that are reacting to an unknown trigger. The chemicals released from the activated immune cells change the function of brain cells called neurons and cause pain, fatigue, cognitive problems, and other symptoms related to GWI. We believe that the best way to treat GWI is to administer anti-inflammatory agents. The idea is similar to how aspirin is used to reduce inflammation and swelling in the body, but common anti-inflammatory drugs do not cross into the brain easily. We are hoping to find plant-based compounds that can reach the brain and reduce inflammation." "One of the main advantages of this study is that it tests compounds that are already available for human use. New drugs may take over 20 years, and millions of dollars, to go through the required regulations to be used in humans. In many cases, a treatment that works very well in animals fails to work at all in humans. During the time taken for drug development, patients continue to suffer. Individuals with GWI have already suffered for over 20 years and it is therefore essential that we test treatments and make them available as quickly as possible. We focus on treatments that allow us to skip animal testing and lengthy drug development. Individuals could take the treatments after the three-year study is completed. However, complete information about the effectiveness of the treatments may take up to 8 years to produce." Aim 1: To identify the most promising botanical microglia anti-inflammatories for the treatment of GWI. We will test nine botanical anti-inflammatory agents in a double-blind, placebo-controlled, crossover trial. Agents tested will include Resveratrol, Reishi Mushroom, Boswellia, Pycnogenol, Epimedium, Stinging Nettle, Luteolin, Fisetin, and Curcumin. We hypothesize that some of the tested agents will be significantly better than placebo at reducing pain, fatigue, and other symptoms associated with GWI. Aim 2 (exploratory): To identify biomarkers of GWI improvement. The second, exploratory, aim is to use machine learning algorithms to determine if blood-based inflammatory factors can serve as indicators of treatment response. Blood samples will be collected at baseline and during each treatment condition. Over 50 inflammatory and microglia-priming agents (e.g., IL-1beta, IL-1alpha, leptin, and eotaxin) will be quantified in the sera. Changes in symptoms in response to treatment will be tested for associations with changes in blood-based markers. We hypothesize that a positive clinical response to the tested agents will be associated with a reduction of inflammatory factors in blood sera. Impact: There are currently no accepted treatments that target GWI pathophysiology. There is a desperate and time-urgent need to identify adequate treatments. The development of promising botanical microglia-modulators would impact science and medicine in two ways. First, it would identify promising treatments that are immediately available to patients with GWI. Second, it would indicate new research directions for the diagnosis and treatment of GWI. We believe this screening approach gives us the best chance of being able to quickly translate research findings into clinical care. SOURCE: CDMRP webpage, award outcomes search. SOURCE: Medical Xpress, Katherine Shonesy reporting, Oct. 22, 2015. For 10 years, Gail De Sciose felt that pain controlled her activities, her schedule, her every move. She often found herself sprawled on the floor of her Birmingham home, sharp pains radiating down her neck, back, and hips. It was an abrupt change from the vibrant life she once led in New York City, where she had worked as a sales manager, traveled around the country, and volunteered at a local animal shelter. "It felt like a hot poker being dragged across my body," De Sciose recalls. And the pain was accompanied by debilitating fatigue; De Sciose remembers falling asleep in the middle of conversations. "There were times I just couldn't function," she says. "I had to cancel theater tickets, vacations, and lunches with friends." De Sciose is one of five million Americans and more than 200,000 Alabamians with fibromyalgia, a disorder characterized by widespread pain that has lasted at least three months and can't be attributed to any definitive cause. But a fibromyalgia diagnosis doesn't lead to a cure. For years after she had a name for her hot poker stabs, De Sciose remained in pain, and that's not unusual: The Centers for Disease Control and Prevention highlights studies showing that fibromyalgia patients rate their quality of life lower than patients with other chronic diseases, and are three-and-a-half times more likely to develop depression than those without the disorder. Those responses could be on the verge of changing, however. At UAB, Jarred Younger, Ph.D., hopes to establish Alabama's first research and clinical care center specializing in fibromyalgia and related conditions, including chronic fatigue syndrome and Gulf War Illness. Already, research by Younger and his team in UAB's new Neuroinflammation, Pain, and Fatigue Lab has revealed possible underlying causes for the disorders and pointed to treatments that are helping to ease pain and fatigue—without side effects—in patients. Younger's work "is really cutting-edge; it's groundbreaking," says David McLain, M.D., a Birmingham rheumatologist who treats the disease and often collaborates with UAB researchers. "He's responsible for opening up a whole new avenue of treatments, and it's fortunate he came to UAB." Younger, an associate professor recruited to the UAB College of Arts and Sciences Department of Psychology in 2014, became interested in fibromyalgia and chronic fatigue syndrome as a postdoctoral fellow at Stanford University's medical school. He had been studying pain more broadly when he realized how poorly understood these disorders were. "Patients are wholly affected," Younger says. "Some used to be athletes, some used to be business owners, and then their lives are taken over." Often, he points out, patients visit doctor after doctor, only to be told repeatedly that they're healthy—and that the pain or fatigue is all in their heads. Younger, along with many other researchers and clinicians, believed otherwise. "I made it my mission to figure out what is wrong with these patients and how to treat them," he says. As a Stanford postdoctoral fellow and faculty member, Younger spearheaded studies that surveyed immune molecules in the blood. He homed in on one particular protein called leptin, released by fat tissue, which appears in greater amounts in the blood of chronic fatigue patients. In fact, Younger could even gauge the day-to-day severity of a patient's symptoms just by tracking his or her leptin levels. These initial findings spurred him to continue investigating inflammatory immune molecules—and to start looking at the brain's role in the diseases. Leptin has the ability to cross the blood-brain barrier and affect neural cells, causing pain and fatigue. But exactly how that happens remains a mystery. Younger thinks it has something to do with microglia, a type of immune cell found in the brain that normally helps to protect neurons. (Left to right) Graduate student Kelsey Campbell, postdoctoral student Joanne Lin, Ph.D., and Younger prepare a neuroimaging scan as part of research to develop a noninvasive tool for measuring brain temperature, which could diagnose neuroinflammation. "Microglia defend our brain against everything," Younger explains. "When we get the flu, for instance, microglia are activated. These cells make us want to crawl into bed and do nothing—so our body can devote its resources to fighting off the flu." In both fibromyalgia and chronic fatigue patients, Younger hypothesizes, the microglia are turned on when they're not supposed to be, causing fatigue or pain, a depressed mood, and cognitive dysfunction. At UAB, he is planning follow-up studies to help find evidence supporting this idea. He faces a crucial challenge, however: Currently, no methods are available to look directly at the activation or inflammation of microglia in living humans. But Younger and his colleagues are working on solutions, including specialized brain scans that measure the temperature of the brain or the presence of certain chemicals. "It's only very recently that people are starting to explore what sensitizes microglia," Younger says. "The cells can be in a quiet, helpful state, or an active, warlike state." His findings, he hopes, will help reveal the difference. At the same time that Younger began studying the pathways underlying inflammation, he also started investigating alternative medicine and off-label treatments that had been used by patients with chronic fatigue and fibromyalgia. In 2009, he first reported the effectiveness of low-dose naltrexone—a drug normally used to treat opioid and alcohol addiction. Women who took 4.5 milligrams per day of the drug reported less pain throughout the weeks that they received it. Interestingly, the naltrexone linked back to Younger's other studies: The drug is known to stop activated microglia from producing inflammatory chemicals. De Sciose—who had resisted taking fibromyalgia drugs throughout the course of her disease because of the side effects that most can cause—heard about low-dose naltrexone from a friend in 2012, shortly after Younger published the results of his second, larger study on the drug. The science behind it seemed sound, she says, and Younger's studies had revealed few side effects. So she started taking a daily dose of naltrexone prescribed by her doctor. "I didn't have any expectations; we hear so much about miracle drugs," De Sciose says. "But within the first two or three weeks, I stopped having that daily searing hot-poker pain. Then, a month later, different massage therapists told me that my muscles were feeling better." Today, De Sciose wouldn't say she's cured of fibromyalgia—she still has to watch her activity levels to prevent flare-ups. But she can make plans again—lunch dates, theater tickets, and trips—without worrying that she'll end up sprawled on the floor every night. "Any small gain in pain reduction or quality of life is very important to me," she says. Younger's discoveries about leptin, microglia, and naltrexone have already begun to change the face of fibromyalgia and chronic fatigue research and treatment. But his work is just beginning, he says. "It's essential that we have a fuller understanding of what's wrong before we're able to find the best treatments," Younger says. So while he's conducting further studies on low-dose naltrexone—as well as other compounds, including the spice curcumin, that are known to affect microglia—he's guiding the efforts of the Neuroinflammation, Pain, and Fatigue Lab toward uncovering the mechanisms behind the diseases. He would like to understand what triggers an increase in leptin production, what leptin activates, and what fires up microglia. He also wants to know how everything connects. "There's a chain of events, and we don't know where leptin falls in that chain," he says. "So we begin with one piece of the puzzle and start looking in both directions." For patients, having any piece of the puzzle can be heartening. "These patients are not well understood," says McLain. "Their families and often their doctors think they're lazy or making up their symptoms. Being able to say, 'here's some of the science behind my illness' certainly makes them more hopeful." Younger, too, is satisfied with the small bits of progress so far, but says that the treatment of chronic fatigue syndrome and fibromyalgia is a decade or two behind other inflammatory diseases. "Twenty years ago, rheumatoid arthritis absolutely wrecked people's bodies, and there wasn't a lot that could be done about it," he says. "Over time, researchers discovered the parts of the immune system that were involved, and that helped them develop better treatments." If Younger's timeline holds true, then relief could be on the horizon for patients who must endure the pain, fatigue, and other symptoms every day. "I feel optimistic that I may wake up some day in the future and be able to feel even better and stronger than I do now as the result of a research finding and treatment to come," De Sciose says. Affect mainly women, though they can impact men and children. Symptoms may include pain; fatigue; cognitive/memory problems; sleep disturbances; numbness and tingling; and sensitivity to temperature, noises, and light; among others. There is no simple, specific test to diagnose these disorders. Physicians often talk with patients about pain and fatigue severity and the presence of other symptoms. Patients with chronic fatigue syndrome suffer daily, long-term, severe fatigue. Gulf War Illness includes chronic, medically unexplained symptoms affecting veterans and civilians involved with military duty in the Persian Gulf region.